Soldiers are more at risk of suicide when they’re repeatedly deployed with six months or less between rotations, and when they’re sent to war too soon after they join the service, new research shows. Such quick turnarounds have become common as the U.S. sends combat troops to Afghanistan, Iraq and Syria. Of the 1.3 million or so active duty military personnel, about 160,000 are permanently stationed overseas, according to the federal government’s Defense Manpower Data Center. 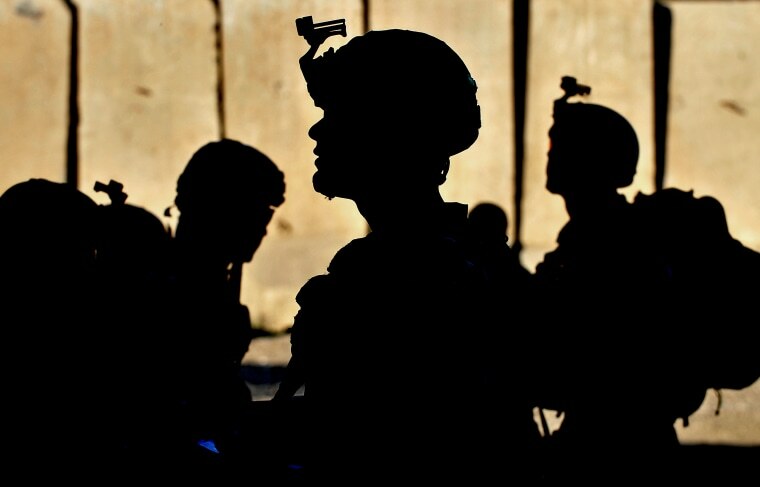 At the same time, suicide rates have soared among veterans. On average, 20 veterans a day died by suicide in 2014, and many more attempted suicide, the Veterans Affairs Department says. “Rates of suicidal behaviors, including suicide deaths, attempts, and ideation, among U.S. Army soldiers increased considerably during the wars in Iraq and Afghanistan,” Dr. Robert Ursano of the Uniformed Services University of the Health Sciences wrote in a report published Wednesday. Ursano and colleagues studied a group of such soldiers: 593 men and women in the U.S. Army who had been deployed twice and who attempted suicide between 2004 and 2009. They were looking for specific factors affecting suicide risk. Getting a chance to prepare seemed to be key, they reported. “Those who served 12 or fewer months before their first deployment were approximately twice as likely to attempt suicide during or after their second deployment compared with those who had more time to train and acclimate to the military before initial deployment,” Ursano’s team wrote in the Journal of the American Medical Association’s JAMA Psychiatry. Those re-deployed within six months or less were 60 percent more likely to attempt suicide. The findings don’t surprise combat veterans, their families and mental health experts who work with veterans. “Psychologically it just makes sense,” said clinical psychologist Tim Barclay of the Collateral Damage Project, a Frederick, Maryland-based nonprofit that offers free mental health treatment to veterans. This stress is worsened if people are deployed too soon, said Patricia Spencer, who trains social workers about military culture. “They haven’t had a chance yet to really bond with their unit, their squad,” said Spencer, who practices in Highland Park, New Jersey, and teaches at Rutgers University. But that's the new way of life in the military, Barclay said. Since Sept. 11, 2001, frequent and repeated combat deployments are the norm. And so are quick assignments after enlistment. “They haven’t had time to acculturate to military life,” Barclay said. In Ursano’s study, 67 percent of the affected soldiers were married. “When you have somebody entering the military, it’s hard enough for an individual to make an adjustment and find a rhythm. Add to that a family — that’s just an added stressor,” said Barclay, himself a former soldier and police officer. Ursano’s team did not find that longer deployments worsened suicide risk. The two main factors were a short time before the first mission, and a short turnaround between missions. "Our findings indicate that suicide attempts among soldiers during or after their second deployment might be reduced by as much as 14.2 percent if all soldiers were in the U.S. Army for more than one year before first deployment," Ursano's team wrote. “I knew to expect another deployment coming up. But then it was like, ‘Oh gosh — you’re leaving in less than six months'." And longer "dwell time" between deployments would also help, they said. Aleah Wood, whose husband flies helicopters, knows what the short turnarounds are like. “It’s hard when it’s so unexpected,” said Wood, who works with the military nonprofit Blue Star Families. Her husband was sent off two weeks ago on a special assignment just six months after returning from an overseas deployment. “I knew to expect another deployment coming up. But then it was like, ‘Oh gosh — you’re leaving in less than six months,'” she said. Wood says her husband is mentally healthy and her family is coping. But the statistics show that not all veterans do cope well. “When someone is frequently deployed, they are losing contact with home,” Spencer said. That also raises the likelihood of suicide. “One of the risks of suicide is the feeling of being a burden. They may feel like they are a burden if they are having nightmares or flashbacks,” Spencer said. Sam Gonzalez lived through it himself. Now a retired Army sergeant, Gonzalez was deployed three times and felt frustrated trying to keep in touch with his family while in Iraq. “I wasn’t able to communicate. It stressed out my wife. It stressed out my mother,” Gonzalez said. “Some of the younger soldiers couldn’t handle it and they were snapping,” Gonzalez, 39, said. “There is no way that you can just deploy, then come back and expect to be back to normal within two weeks.” And while adjusting to the military is hard, re-adjusting to civilian life may be even harder, he said. Gonzalez said therapy got him through it, although it did not save his marriage. Divorced since 2011, he now counsels fellow veterans at Vets4Warriors, a hotline for troubled veterans supported by Rutgers. So what can veterans and their family do? Barclay believes the key is training, just as for combat. “We just expect soldiers to come back and automatically adapt to civilian life or garrison life but we don’t give them the training … to be effective husbands or employees,” he said. “One of the things I always thought would be beneficial would be if when soldiers leave combat, if they were able to frame it as simply another mission,” he said. Gonzalez said shorter, less frequent deployments would also help, but Barclay said that may not be possible. “It’s a new state of war that we’re in, fighting terrorism,”he said.